Copenhagen was beautiful! Clean, friendly, very nice. I would go there again in a heart beat. They all ride bikes there. Unfortunately I didn’t get any photos, but they have very clever ways of building boxes onto the front (mostly) of their bikes to hold their children who are too young to ride. I saw one bike with a rather large box that had 4 little ones in it, ranging in age from about 1.5 to 5 years old. There were a few with the little trailers that hook onto the back of the bike, but most of them fashion these front box-type arrangements. I also learned that if you hear the tinkle of a bike bell, you had better stop because you are in the way of a biker and they are about to swerve around you. Better to stop because they have already seen you and are dodging around you. The foot traffic is heavy and so is the bike traffic. I found out too late that our hotel has bikes you can borrow from them–most places over there do. 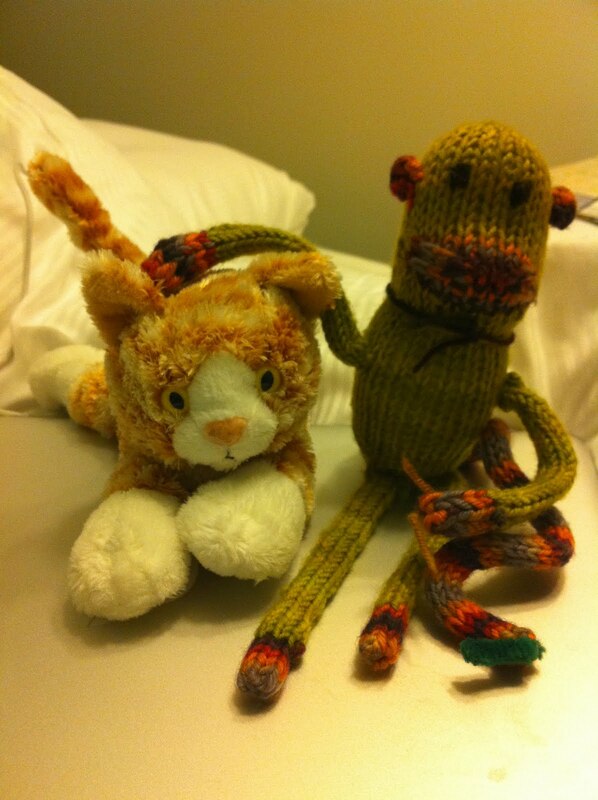 Monkey met a friend to accompany him on his journey. Meet Cat. He looks remarkably like Tang, who is staying in LA with Carson while I am on my cruise. One of the stores I have on my list for this trip was Camper shoes. With the help of the GPS on my iPhone, I was led right to it. I asked for their most comfortable shoes and these were the two that they recommended. They both have gel insoles. When I tried them on my feet said ahhhhhhhh…………..so I bought both of them. And a pair for Carson that you will see in my next post. Camper shoes are hard to find the USA. They only have stores in big cities–LA, Boston–I think the one in LA closed. The yarn shop crawl across the Baltic starts with the next post. See you then!